A few years ago Paul Colman tried to sell a print out of this blog on Ebay. As far as I am aware no one was remotely interested. undaunted by this I have collected together the ‘best’ posts from adliterate over the past six years and had those lovely people at Newspaper Club print it. 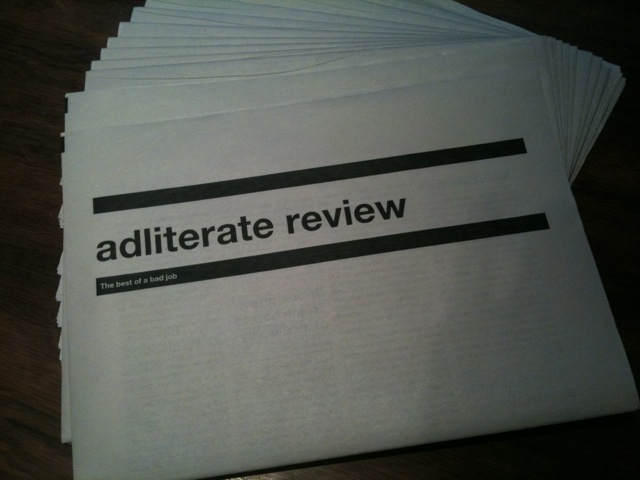 It’s called adliterate review and there are 20 copies for anyone that wants one or needs to replace their cat litter. An email to me gets one until I run out. Be warned it’s as turgid visually and verbally as the online version. If they haven’t been claimed please be aware I am searching for your email address now..! Well how dare you – I sold it for about 36p, I think. As this post proves I certainly got an opening bid of 1p very early, as well as some questions from interested parties. I would love one if there’s still one left. I’m afraid that the first 20 copies have now gone. Everyone that has asked for one by now will get it in the post gratis. I’m thinking of doing another print run if there is sufficient interest though. Sorry I missed this up until now. I’d love a copy if you do another run. If you’re doing a second run, I’d also like a copy please! Am I in there? I remember doing some GREAT comments before the op but I can’t find most of them now. Mrs Belmont, I’m afraid that I have removed all the comments from the posts for the purposes of this publication. This is because the sheer number of your comments threatened to make the review some 126 pages long and because the quality of those comments was so eyewateringly brilliant that they made me look bad. Managed to get a copy. Thank you very much. I feel somewhat more prepared for building my career as a planner now; I read it daily! Second print run of 50 underway at the moment. Trying to decide whether to ask for the costs to be covered this time or to keep it free. News soon. Could always sell ad space to cover the costs.Your new business department should be your first customer.